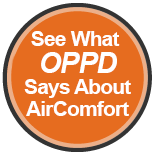 AirComfort Heating and Cooling has built a reputation in Omaha, NE for doing the job right the first time. Read our reviews on our heating, cooling and indoor air quality services in Omaha, NE for real stories on how we have satisfied our customers. The 2 installers were very polite, efficient and the one was very knowledgeable. Took the time and patience to explain and go through all the new bells and whistles on our new thermostat.